The Yarrawonga Weir is located on the River Murray between the towns of Yarrawonga, Victoria, and Mulwala in New South Wales. Construction of weir began early in 1935 and was completed in 1939. Yarrawonga Weir does not have a navigation lock as the River Murray Waters Agreement of 1915 provided for navigation upstream only as far upstream as Echuca. Similarly, upstream storages also do not have navigation locks. However, the lake formed by the weir, Lake Mulwala, has become the focus of a valuable tourist and recreation industry for the area, with sailing, water skiing and fishing all popular activities. A privately owned hydroelectric station and a fish lift were added to the structure in 1994. The major tributaries upstream of Yarrawonga Weir are the River Murray (below Hume Dam), the Kiewa River and the Ovens River. The structure is located about 540 km from the headwaters of the River Murray, and almost 2,000 km from the river's mouth. During high flows and floods, water takes around 6 days to reach Yarrawonga from the river's headwaters. Average annual rainfall varies from about 2,000 mm in the mountains to about 500 mm on the plains that surround Lake Mulwala. The upper catchment includes some of Victoria's highest and wettest peaks, including Mount Bogong (Victoria's highest mountain), Mount Hotham and Mount Buffalo. Temperatures also vary widely between seasons. In summer, the temperature can rise above 40 °C. In contrast, sub-zero temperatures are experienced across the catchment during winter. Evaporation readings taken at Lake William Hovell and Lake Buffalo in north-east Victoria indicate average annual gross evaporations of about 810 mm and 990 mm respectively. Across the flatter country to the north, average gross annual evaporation can be well over 1,200 mm. Yarrawonga Weir is the largest of the 14 weirs along the River Murray downstream of Hume Reservoir. It is made up of 2 groups of gates — 8 on a southern structure and 2 on a northern structure. The southern side gates are used at all flow levels. The northern gates are only used during floods larger than 60,000 ML/day, to limit flows along the downstream side of the weir embankment that could cause scouring. 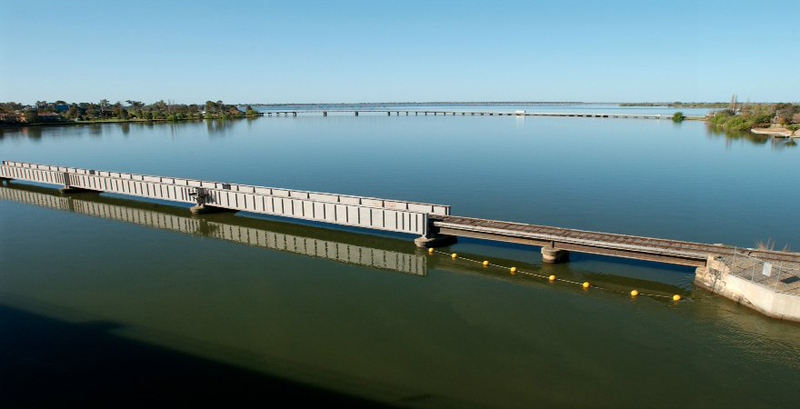 Yarrawonga Weir is the point of the greatest diversion of water from the River Murray. The 2 main irrigation channels from Lake Mulwala are the Mulwala Canal and the Yarrawonga Main Channel. The Mulwala Canal, on the New South Wales side, has a discharge capacity up to about 10,000 ML/day. The Yarrawonga Main Channel, on the Victorian side, has a discharge capacity of 3,200 ML/day. These 2 channels serve a total area of more than 8,000 km² of irrigated land across the 2 states. Lake Mulwala has a Full Supply Level (FSL) of 124.90 m above sea level and a capacity of around 118 GL. Although a significant storage, its capacity is about 26 times smaller than Hume Reservoir, and 34 times smaller than Dartmouth Reservoir. Only some of this water can be used for local irrigation, as 113 GL is 'dead' storage used to maintain the water level near FSL. This allows gravity diversion of water down both irrigation channels. The hydro-electric power station at Yarrawonga Weir was completed in 1995 and has a nominal capacity of 9 MW. It uses water released from Lake Mulwala and can produce enough electricity to supply a medium-sized town. The electricity is sold to the Victorian grid and the power station has the unusual capability of opearting with a very low head of water, down to 3 m.
Since river regulation began, seasonal flow patterns along the River Murray have altered significantly. The system has been managed to store and supply water in a manner that decreases winter-spring flows and increases summer-autumn flows. A result of this change is an increase in the frequency of forest flooding during times when it would typically remain dry. This undesirable outcome can occur when unexpected changes in weather alter water demands resulting in the rejection (called rainfall rejection) of previously ordered irrigation water that has been released from Hume Reservoir. If Lake Mulwala is already full, then this additional water needs to be released into the River Murray downstream of the weir. The River Murray downstream of Tocumwal enters the 'Barmah Choke', where the river channel becomes very narrow and shallow. This natural constriction results in frequent overbank flooding and has created the Barmah–Millewa Forest — an important forest wetland. Railway and road bridges over Yarrawonga Weir. If the release rate exceeds the channel capacity at the Barmah Choke, the water spills into the forest causing unseasonal flooding and adverse effects to the forest ecology. It is also a lost resource. Lake Mulwala has only a limited ability to store water above its operating level. This is one of the primary reasons why the target water level in Lake Mulwala is often a little below the Full Supply Level. The risk of unseasonal flooding in the Barmah–Millewa Forest can also be reduced by targeting a flow downstream that is well below the channel capacity of the 'Choke' at times when rainfall rejection can occur. At other times of year, some water held in Lake Mulwala may be released to assist meeting downstream flow targets.